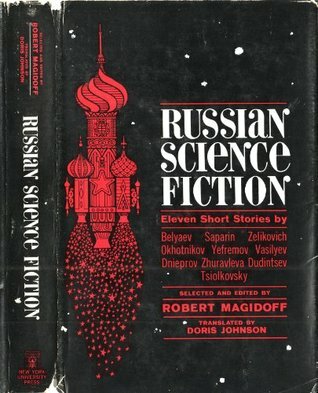 Written during the height of the Cold War, these eleven science fiction short stories are from some of the sharpest minds in the U.S.S.R., disguised as "fantasy" responses to their society that were not officially permissable in Soviet literature during those secretive, suspicious and unsettled times. The stories and authors are:'Invisible Light' by Alexander Belyaev; 'TheWritten during the height of the Cold War, these eleven science fiction short stories are from some of the sharpest minds in the U.S.S.R., disguised as "fantasy" responses to their society that were not officially permissable in Soviet literature during those secretive, suspicious and unsettled times. The stories and authors are:'Invisible Light' by Alexander Belyaev; 'The Magic Shoes' by Victor Saparin; 'A Dangerous Invention' by E. Zelikovich; 'The Fiction Machines' by Vadim Okhotnikov; 'Shadows of the Past' by Ivan Yefremov; 'Cor Serpentis (The HEart of the Serpent)' by Ivan Yefremov; 'Flying Flowers' by Mikhail Vasilyev; 'The Maxwell Equations' by Anatoly Dnieprov; 'The Astronaut' by Valentina Zhuravleva; 'A New Year's Fairy Tale' by Vladimir Dudintsev; and Appendix 'On the Moon' by Konstantin Tsiolkovsky.